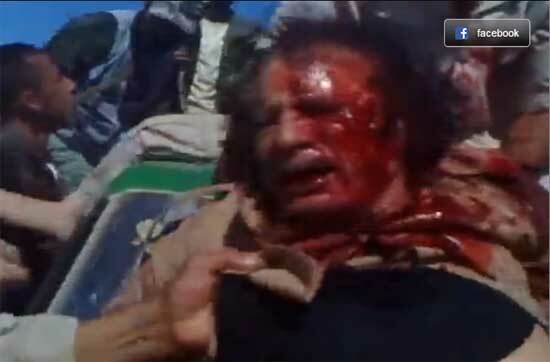 Libyan tyrant and sponsor of international terrorism Muammar Gaddafi. He ruled for 42 years, variously styling himself as 'Brother Leader', 'Guide of the Revolution', "Guide of the First of September Great Revolution" and 'King of Kings'. He was the longest serving of all current non-royal national leaders and one of the longest serving rulers in history. 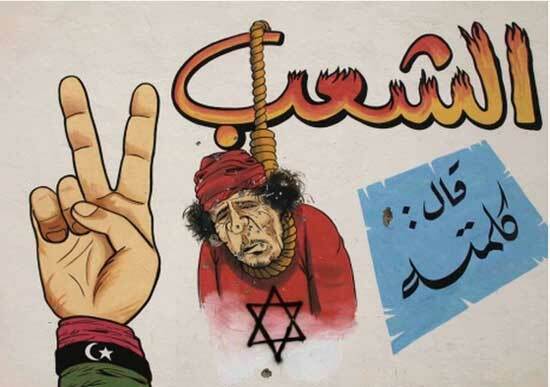 From all people Gaddafi, the Islamic Antisemite who expelled virtually all Jews from Libya, was falsely accused of being a Jew by rival Islamic Antisemites..
Islamization and Arabization campaign to cleanse Libyan society of Western influence. Latin street signs removed, the sale and consumption of alcoholic beverages banned, both foreigners and much of the Libyan Jewish communities.expelled. Prior to their expulsion, the Italian community was forced to exhume the remains of their dead to take back to Italy, an event televised live. Benghazi cathedral converted into ruling Arab Socialist Union headquarter | Tripoli cathedral converted into mosque, on Libyan stamp a.k.a. "Zaoviat Amura Mosque"
Declaration of Agreement on the Principles, Fundamentals, and Objectives of the Libyan Struggle (The Libyan National Alliance, The Libyan Movement For Change And Reform, The Republican Assembly For Democracy And Social Justice, The Libyan Tmazight Congress, The National Front For The Salvation Of Libya, May 9, 2003): "Colonel Mu’amar Ghaddafi, and his corrupt regime, was, and continues to be primarily and directly responsible for all the evils, disasters, and tragedies that have plagued our country. 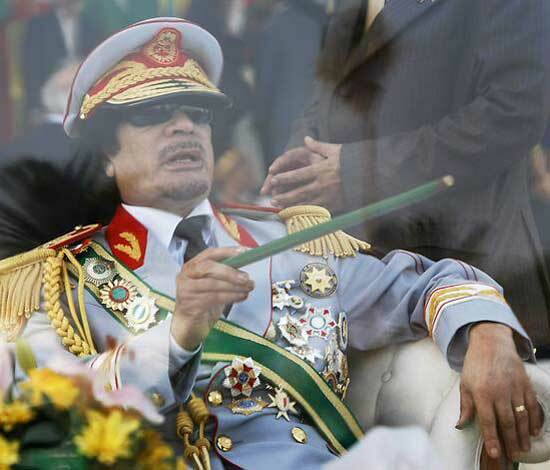 He is also responsible for the current state of complete chaos, collapse and deterioration suffered by our country and people at all levels.The continuation of the Ghaddafi regime represents the prolonging of the disastrous tragedy faced by our country. There is neither hope, nor ability to rescue Libya from its tragic reality, and to enable it to achieve the dreams and aspirations of its people, while Colonel Mu’amar Ghaddafi continues to be the head of the state. There is no hope for any reform in Libya, except by ridding the country of the existing regime and establishing a constitutional, democratic system, inspired by the Libyan people’s faith, culture, history, and values This system must derive its legitimacy from a constitution and from a popular mandate, through a process of free elections, which would enable the new government to meet the requirements of a national reconciliation period, the rebuilding of the country, and further enable it to achieve the goals, hopes and aspirations of our people." France, Libya to settle over 1989 airliner bombing (Middle East Times): "In 1999, a French court convicted six Libyans in absentia – including the brother-in-law of Libyan leader Moammar Qadhafi - for organizing the bombing, which killed 170 people." Abu Nidal organization (ANO) a.k.a. Fatah Revolutionary Council, Arab Revolutionary Brigades, Black September, and Revolutionary Organization of Socialist Muslims (Patterns of Global Terrorism -2001, Office of the Coordinator for Counterterrorism. U.S. State Department: "Has received considerable support, including safehaven, training, logistic assistance, and financial aid from Iraq, Libya, and Syria (until 1987), in addition to close support for selected operations." Country Reports on Human Rights Practices, Libya - 2001 (Bureau of Democracy, Human Rights, and Labor of U.S. Department of State): " ... a dictatorship that has been ruled by Colonel Mu'ammar Al-Qadhafi (the "Brother Leader and Guide of the Revolution") since 1969 ... Qadhafi created a political system that rejects democracy and political parties ... The judiciary is not independent of the Government, and security forces have the power to pass sentences without trial ... Libya maintains an extensive security apparatus, consisting of several elite military units, including Qadhafi's personal bodyguards, local Revolutionary Committees, and People's Committees, as well as "Purification" Committees. The result is a multilayered, pervasive surveillance system that monitors and controls the activities of individuals. The various security forces committed numerous serious human rights abuses ... The Government dominates the economy through complete control of the country's oil resources, which account for approximately 95 percent of export earnings and approximately 30 percent of the gross domestic product. Oil revenues constitute the principal source of foreign exchange. Much of the country's income has been lost to waste, corruption, conventional armament purchases, and attempts to develop weapons of mass destruction ... Citizens do not have the right to change their government ... The Government restricts basic worker rights, uses forced labor, and discriminates against foreign workers ... The private practice of law is illegal; all lawyers must be members of the Secretariat of Justice ... The Government restricts freedom of religion ... Independent trade unions and professional associations are prohibited, and workers do not have the right to form their own unions ..."
Throwing Money Around (Times Online): Libya's dictator "Colonel" Gaddafi still can't seem to get promoted to general, but the Times of London reports on his latest antics: Throwing fistfuls of cash from his open-top limousine to puzzled villagers lining the route, Colonel Muammar Gaddafi and his flamboyant roadshow rumbled into drought-stricken Malawi yesterday. . . . Police were brushed aside by Colonel Gaddafi's fearsome female bodyguards in their figure-hugging green uniforms as he made his triumphal appearance atthe head of a cavalcade of 70 armoured vehicles. There was little danger of him running out of money to hurl at bystanders on his 218-mile drive from Lilongwe, the government capital, to the commercial centre at Blantyre, because one of the cars in his entourage was reported to be stuffed with $6 million (£3,800,000) in cash. CIA World Factbook (Libya): "Libya claims about 19,400 sq km in Niger as well as part of southeastern Algeria in currently dormant disputes."